I hope you’ve all had a great weekend. We finally got a chance to go to Barnes & Noble for our date night and I thoroughly enjoyed my cafe mocha, catching up on Bust Magazine, and jotting down the title of lots of new books for my wishlist. 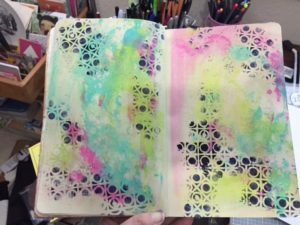 I’ll tell you about those in another post because this post is about art, color and finding time to create. I’ve read a couple of articles lately which have inspired me but I am always finding it hard to carve out sufficient time for crafting. I want a full day to sit at my table and craft. But what if you just don’t have the time? So while watching some Youtube videos on crafting (maybe I should cut down my Youtube time but that’s for another discussion) I found Maremi SmallArt and thought her 1 minute challenge was fantastic. This is just what I needed. How many of us complain about not having enough time? I know I’m always saying that but if you just put aside a couple of minutes you can actually get a lot done. 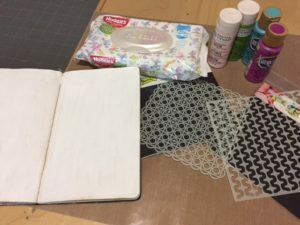 Her challenge was to set your timer to one minute and make some backgrounds for your art journal, cards or whatever mixed media projects you are working on. 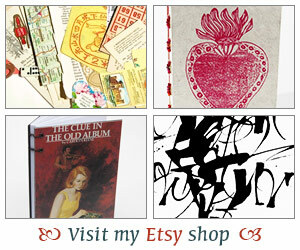 I set aside some paints, a couple of stencils, my journal and baby wipes. I had some false starts. One because it was hard to squeeze out paint from some of my paint bottles so I moved to squeeze-y tubes. Then because I squeezed too much paint. Isn’t it funny when you haven’t done something in a while, you get flustered more easily? Finally, I got my backgrounds done in exactly one minute. Are these beautiful or perfect? No, I was aiming for fun and a learning experience. Now I don’t have a blank page staring at me. I can go back whenever I want and add text, stamps, whatever. This showed me though that even with a bit of time I can create something. So hope this helps you think about your art/craft projects. Maybe you’ve already been doing something like this or this might be something you want to try as well. I would love to hear if you have some advice or tips on making time for all of your hobbies. Seeing all the creative videos and the Pinterest pic do cut into the creative time! Plus, I get too many ideas and don’t get started on any of them. I like the idea of a one minute background!